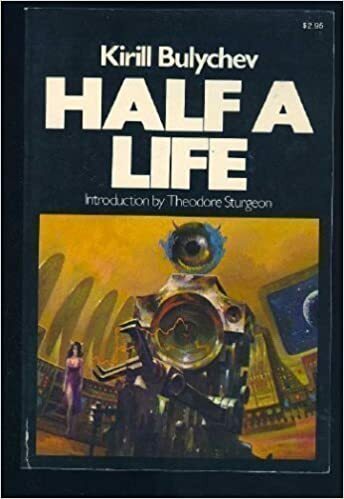 by Kirill Bulychev, translated by Helen Saltz Jacobson and introduced by Theodore Sturgeon, 1977, 142 pages. TLDR: 3 out of 5 for quirky stories in a refreshingly different voice. This book is in the McMillan best of Soviet Sci-Fi series and features seven short stories selected by Sturgeon to showcase the author. These stories really range in style, and I found them reminding me of a variety of authors from Clark to Lem and even to Vance, though these stories never reach the levels of absurdity that the latter two can reach. Some of the stories were quite moving, others more comedic. The theme seems to be one of crossing. In one story an Olympic official must cross the galaxy to investigate an incident and experiences cultural disorientation. In another a scientist must help rescue a group of people trapped by a cave-in by melding minds with a survivor. In a third, telephone lines get crossed, both in distance and in time. And in another story, a 100 year space exploration mission gets crossed by a newer and faster mission that was launched later. Check out the links below for more. The stories themselves are not groundbreaking, but it's nice to read a different voice for a change, and to read of life in the Soviet Union that isn't melancholy or oppressive.This feels more like a true slice of life. I found the writing in the title story to be particularly nice, enjoyed how in the opening scene the author started by describing the scene from a distance and then zoomed in slowly to detail.